A scientist has made a startling discovery about chemical properties of synthetic plastic polymers. Not only is it suffocating sea animals in the ocean but it will consume all the oxygen on Earth, which can potentially eliminate every life on the planet. How will humans combat this pollutant and survive? Year 2101, Earth diagnosis: hypoxemia. Yellow crystalline substance blanketed the earth skies. Birds grasping for air were falling from the skies like flies expose to pesticides. The Earth's oceans were also envelope in the yellow crystalline substance. Asphyxiated amphibians were rushing out of the ocean for a taste of fresh oxygen. The Earth is transforming into a hypoxia environment. Earth's prognosis: The extinction of all life. 24 hours earlier Dr. Pete Providence, expert plastic scientist had gather years of research on the environmental degradation of plastic. It has been long thought that plastic are not biodegradable but he made an alarming revelation. Polymers of plastics such as Polyvinyl chloride slowly react with oxygen to form highly lethal methyl vinyl ketones. Over the years, more and more plastic polymers were consuming oxygen at an increasing high rate forming methyl vinyl ketones in the process. Not only is methyl vinyl ketones toxic but the reduction of oxygen is detrimental to the sea life. Devoid of oxygen thousands of sea animals were suffocating in the ocean. If these pollutants were ever to become gaseous, enter the Earth's atmosphere, terrestrial life would be endangered too. Please listen and reflect careful over my words"
After speaking like a true bard, the crowd bombards them with ridicule. Dishearten, Dr. Pete and Vinyl went into the lab to synthesize a gaseous form of plastic polymers. 12 hours later they had translucent golden gaseous growing polymers enclose with a steady supply of oxygen. Dr. Pete was ecstatic and planned to introduce this as part of this second speech for tomorrow. They left the laboratory but they have forgotten to turn off the oxygen gas that was supplying the proliferating polymers. The polymers exploded from out their container. As soon as they came in contact with the air, they multiply rapidly. They tore through the building and into the outside air. The Wind dispersed the polymers everywhere including into the ocean. The golden polymers were enclosing the Earth in their tight grip and squeezing the oxygen out of it. At an emergency national health meeting, Dr. Pete told everyone what had happen. The scientists predict in 7 hours, all life will perish unless they do something to rid the Earth of the synthetic polymers. The scientists deliberate for 3 hours but couldn't develop a solution. During that time massive amounts of dead animals were propping from the ocean floors. Sea animals were rushing on land to breathe in oxygen only to find out they didn't have the lungs to meet their demands. Birds were dropping like hail from the skies. Amphibians, birds were walking among humans on the ground. People were panicking, turning blue, ghastly pale with death creeping upon us. Dr. Saviour Grant had a solution. He had developed a microorganism that consumes plastic. He was unsure if the microorganism could consume the synthetic polymer but it was the only plan. They created an aerosol formulation and had airplanes shoot it throughout the skies and into the seas. It was working, the yellow crystalline polymers was dissolving. The skies and oceans were returning back to blue. 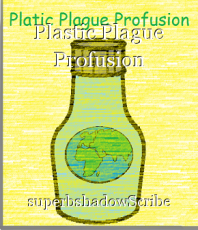 Based on Dr. Pete Providence and Vinyl Warning findings, humans greatly reduce plastic consumption, production, and increase recycling to build a healthy forever lasting planet. This page was created in 0.4067 seconds.